an earth-like world where magic bubbles away beneath the surface, beyond the ken of the common folk - may take so many forms that they really are a thousand worlds in one. This is the second rulebook for the Omnifray RPG. It continues on from the Basic Handbook, delving deeper into the mysterious fabric of the Enshrouded Lands, with detailed information on possible backgrounds for player characters and masses of material on an array of secretive cults. 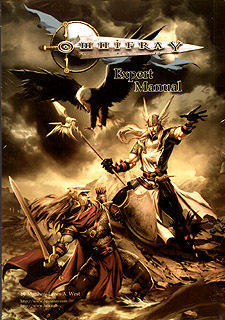 It presents the standard advanced rules for fantasy Omnifray in full. The complete Omnifray system awaits you. This book gives your PCs greater access to feats of physical energy and concentration as well as full access to feats of elder magic, unholy magic, holy magic, mystical power and destiny, downtime feats such as divination and herbalism and feats of combined physical energy and concentration. You must be familiar with the Basic Handbook to use this book. Omnifray is intended for a mature audience.